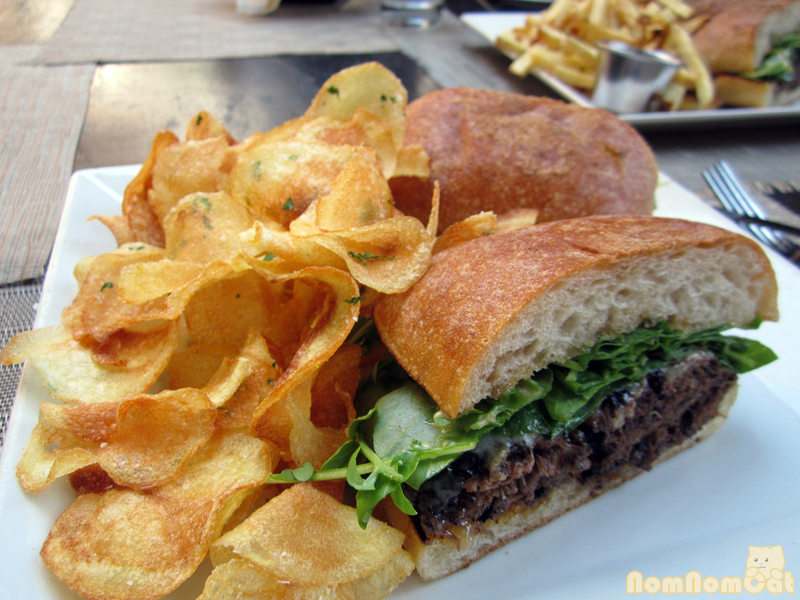 Oh, DineLA – some of our favorite weeks of the year. 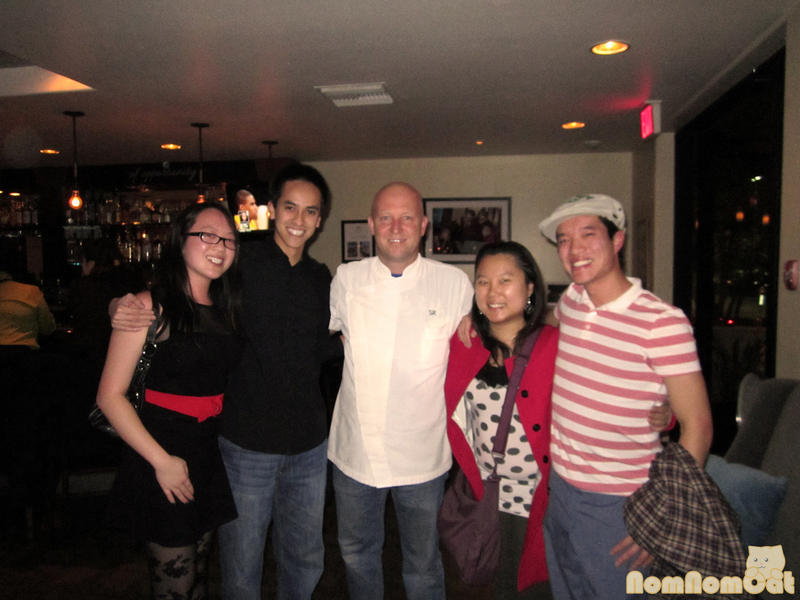 Every year, the winter dineLA falls around early February, just in time for Martin’s birthday! This year, after much scrutiny of the posted offerings from the MANY participating restaurants, he selected Stefan’s at LA Farm, recently renamed to Stefan’s at Lantana (for its location at the Lantana campus in Santa Monica). His main reasoning? We’ve always wanted to check out this restaurant owned by Top Chef contestant Stefan Richter. His secondary reason? DineLA dinner here is rated $$$ ($45/person) for a 6 course tasting menu (SIX! ), definitely one of the better deals available! 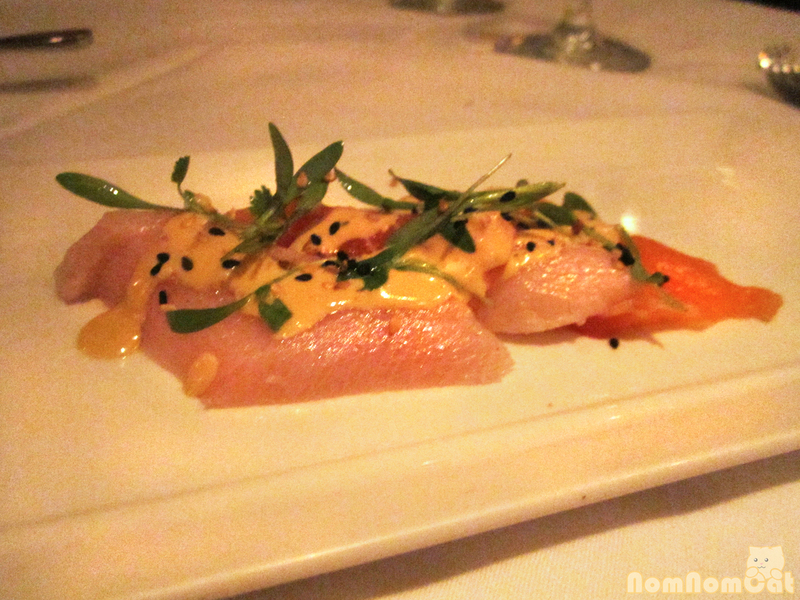 Course 1: Cali Crudo – halibut, salmon, lime yuzu vinaigrette. Neither of us could resist ordering this dish of buttery, thick slices of sashimi drizzled with a bright, citrus-y vinaigrette. 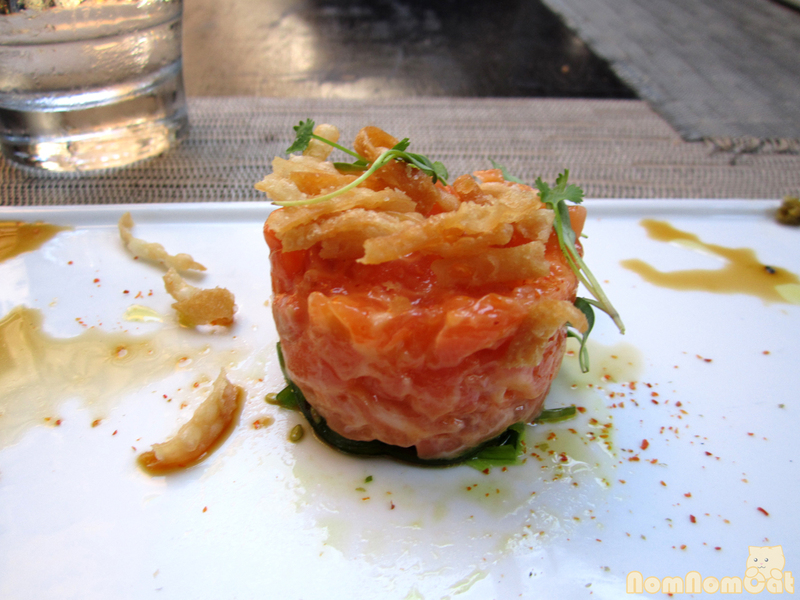 A very refreshing and light starter worthy to represent California. Course 2 (m): Raviolo & Pork Cheek – brown butter, pecorino, parsnips. 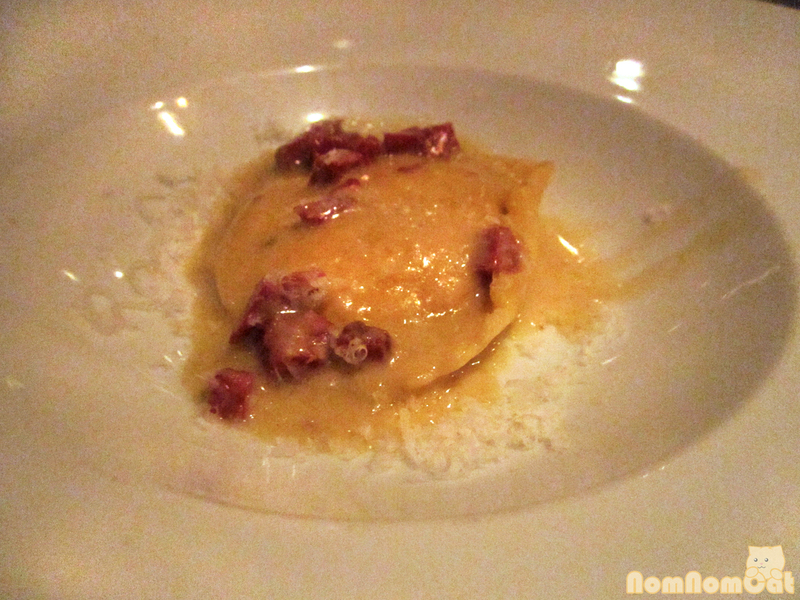 Martin selected this raviolo that wafted the aroma of bacon from the moment it was set at our table. He polished it off with a quickness, barely sparing one small taste for me! Course 2 (a): Mushroom Risotto – hen of the woods, blue cheese. I love mushrooms, and hen of the woods fall pretty high on my list of favorites (#1 being chanterelles). 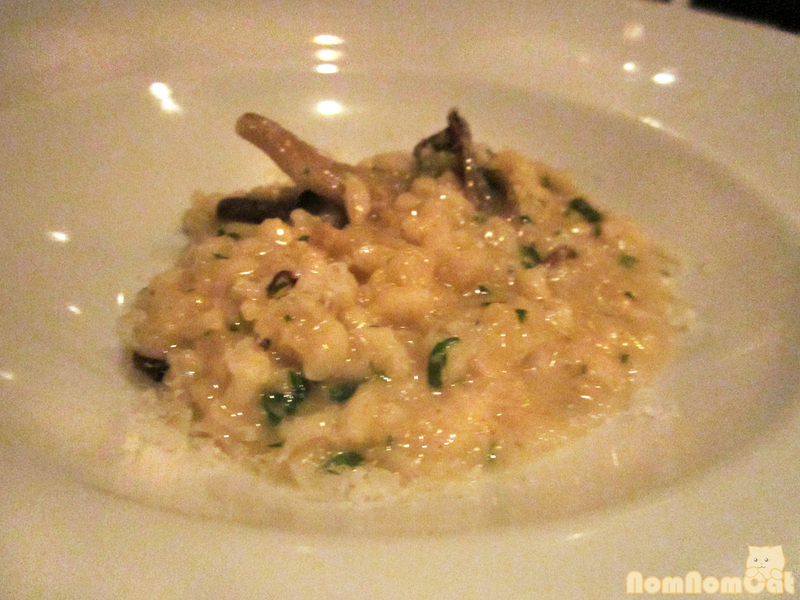 The risotto had a great al dente texture and the cheese was not too overpowering. Solid. 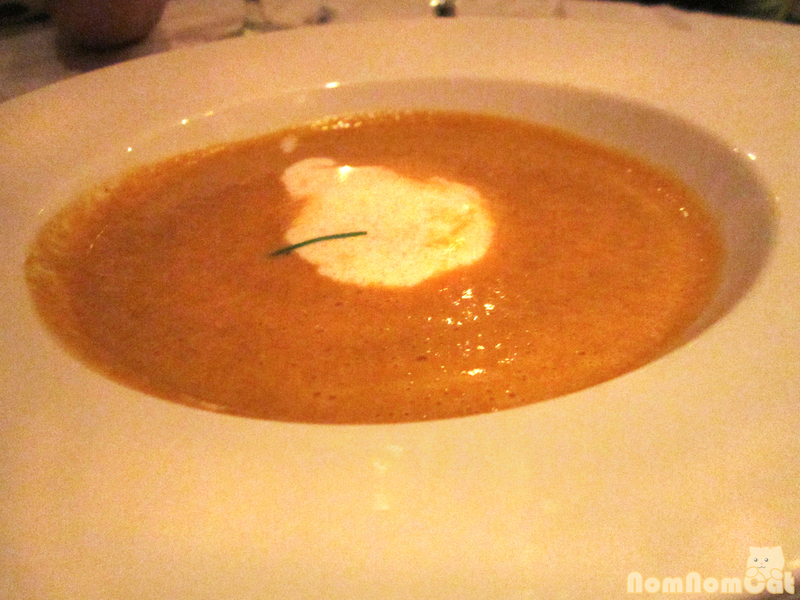 Course 3 (both): Pumpkin Soup. We both selected this soup over the other option of a leek soup. I think Martin found it to be a bit too sweet, but I didn’t mind it once I accepted that I was drinking a hot, slightly savory, liquid pumpkin pie (in a good way). It felt reminiscent of Thanksgiving. 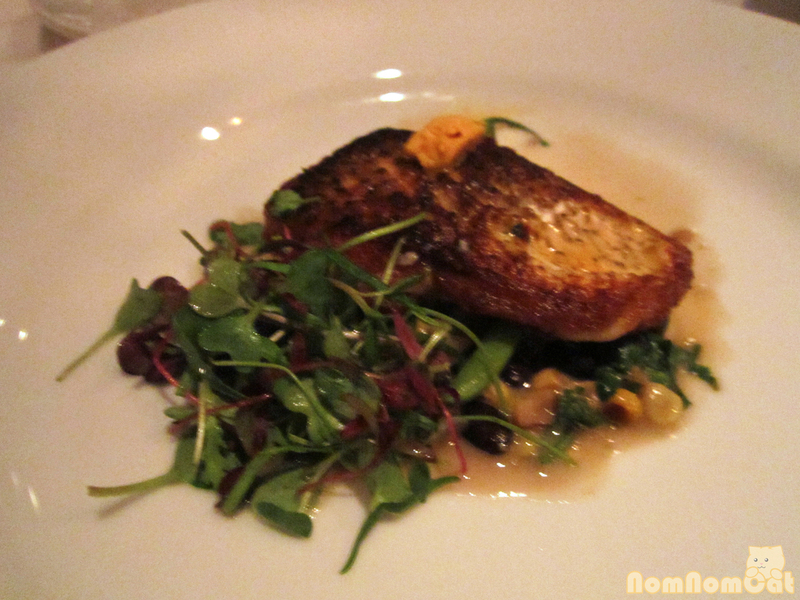 Course 4 (m): Crispy White Fish – chipotle butter, black beans, cilantro, corn, haricot verts. Martin’s fish course had a stunning sear. I mean it was BEAUTIFUL. I heard the crunch as his fork sank into the fillet and felt quite jealous. His only complaint was a slight inconsistency in plating between his and another plate at our table with regard to the amount of the chipotle butter garnish (although we suspect the plate with a smaller dollop may have just melted before it got to our table). 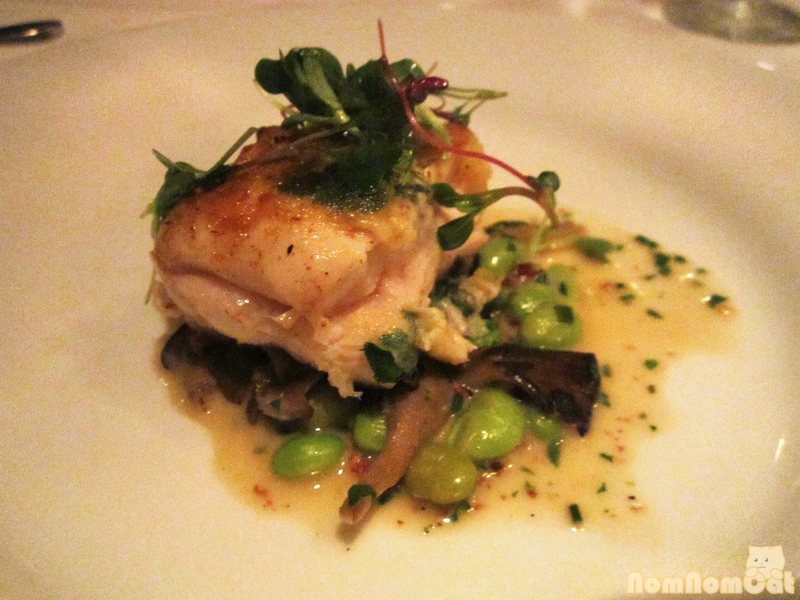 Course 4 (a): West Coast Halibut – brik dough, edamame, shimeji mushrooms, fingerlings, pancetta. The halibut was cooked perfectly with a crispy sear and a moist but easily flaked texture. The pancetta flavoring in the sauce added an earthy contrast, and the edamame and shimeji mushrooms hidden underneath were great accompaniments. 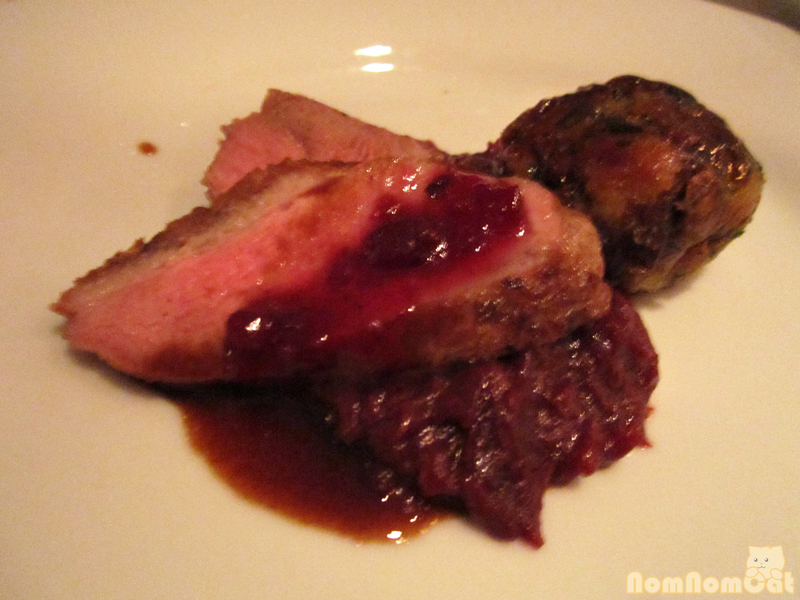 Course 5 (m): Duck Breast – braised red cabbage, pretzel dumpling, lingonberry sauce. Martin was a teeny bit hesitant to order duck breast as some places tend to overcook the breast. His concerns were instantly alleviated when we saw the pale pink medium/medium-rare of his thick slices of seared duck. The lingonberry sauce was tart and delicious, although, to be honest, our only other reference point is IKEA’s. 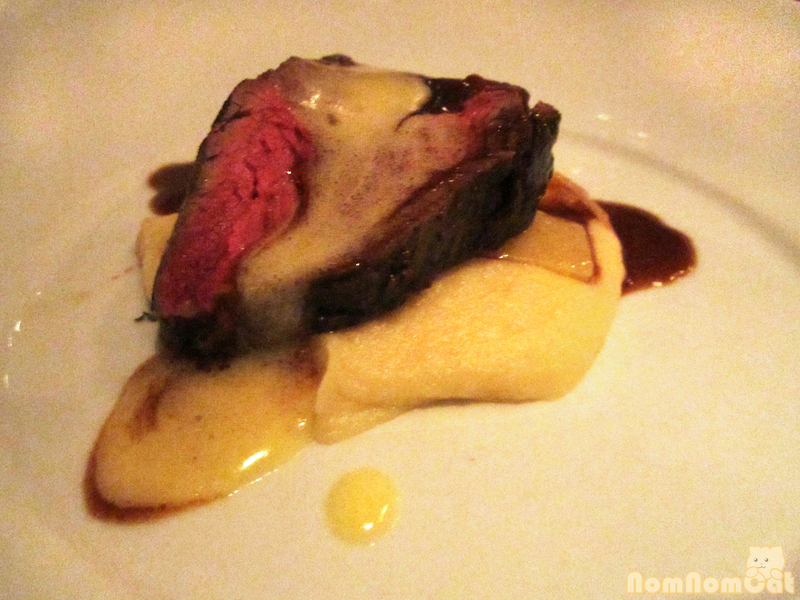 Course 5 (a): Beef Tenderloin, rare – parsnip mash, sauce hollandaise. Helen and I both love cow, so we were especially excited for this course. 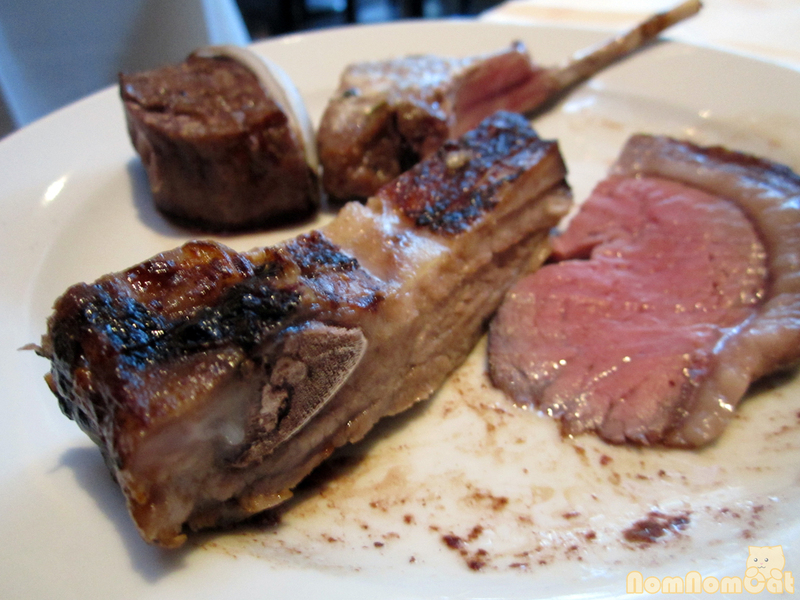 We requested ours cooked rare and they were wonderful. The jus (was it a red wine reduction?) melded nicely with the hollandaise. The parsnip mash was a great spin on ordinary ol’ steak & potatoes. 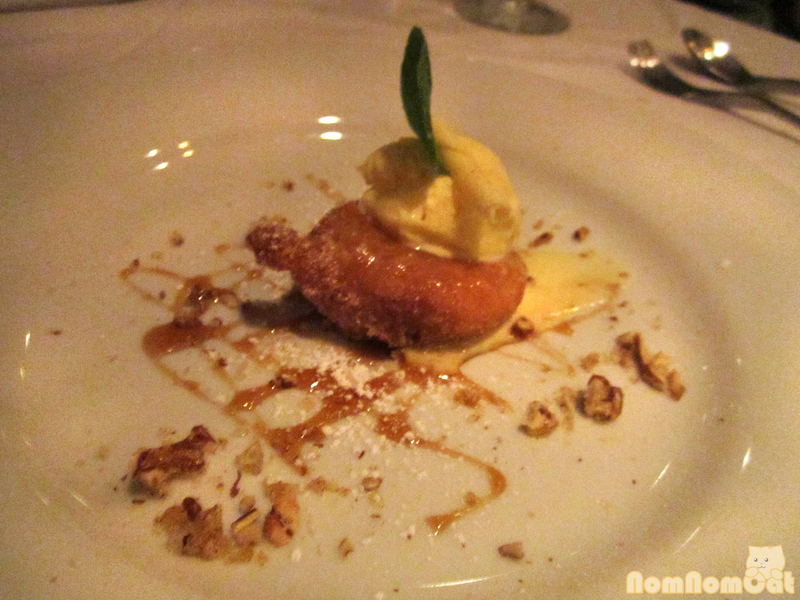 Course 6 (m): Apple Beignet. Martin was so excited when his dessert was presented. Fried sweets a la mode? Sign us up! The biggest surprise was what makes it an “apple beignet” — in the middle of the batter coating was a half apple. Yes, they deep fried a fresh apple. Awesome! 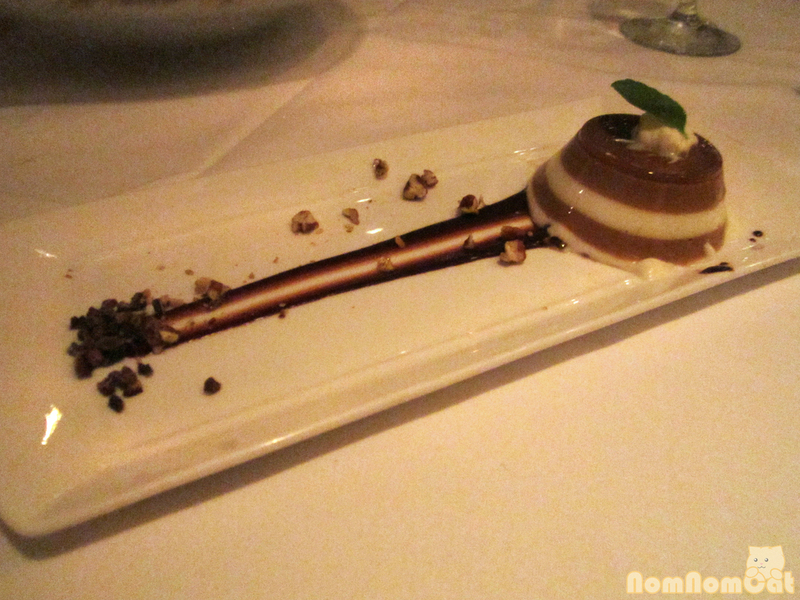 Course 6 (a): Coffee & Vanilla Panna Cotta. 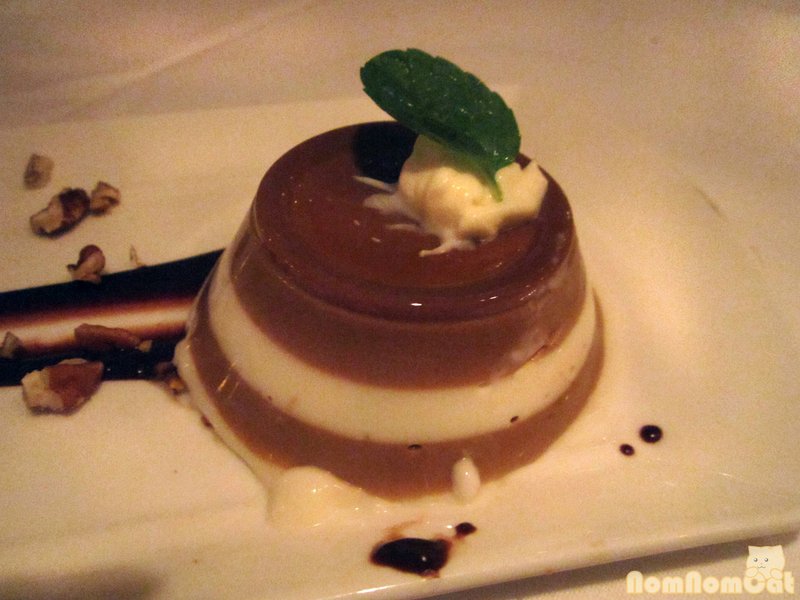 The panna cotta was a bit more jelly-like than the thick, creamy textures I’m used to, but it was enjoyable nonetheless. Plus, the layers looked so lovely and the coffee essence was balanced – not too bitter, not too sweet. Of course, we had to ask him for a quick photo! We were very pleased with our meal and we were especially excited to see that Stefan himself was out in the dining room greeting guests and asking about the food and experience. 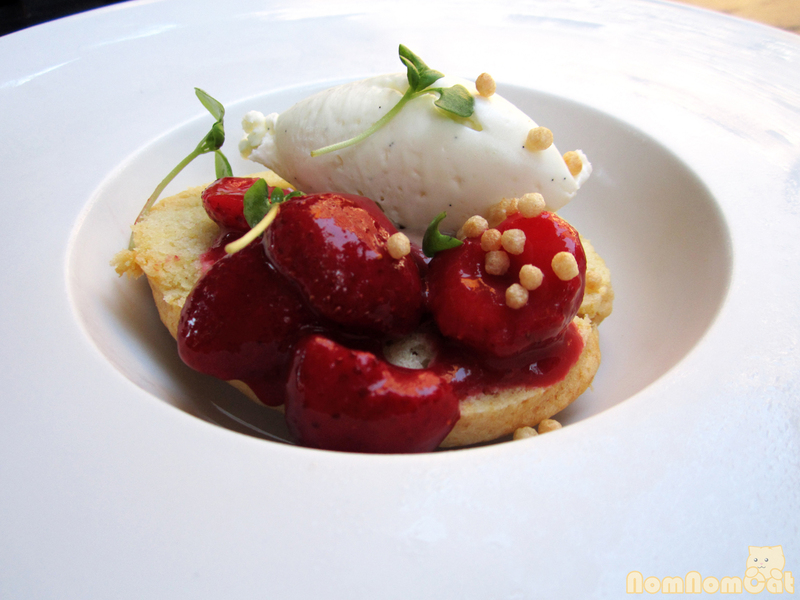 We were also impressed at the quality of their tasting menu during restaurant week and would love to return sometime and check out their regular menu! All in all, it was a fantastic evening. 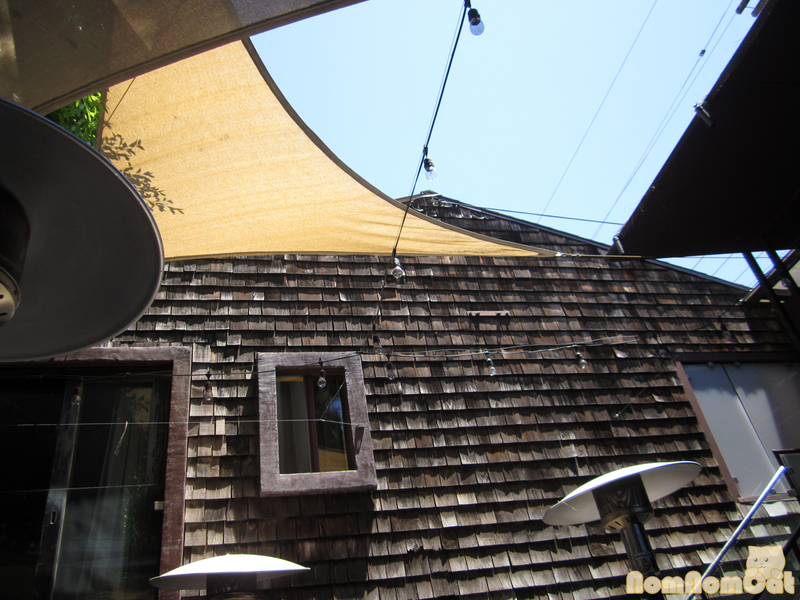 I would definitely recommend checking out Stefan’s any time during the year, but the next dineLA will be in July… hint hint. 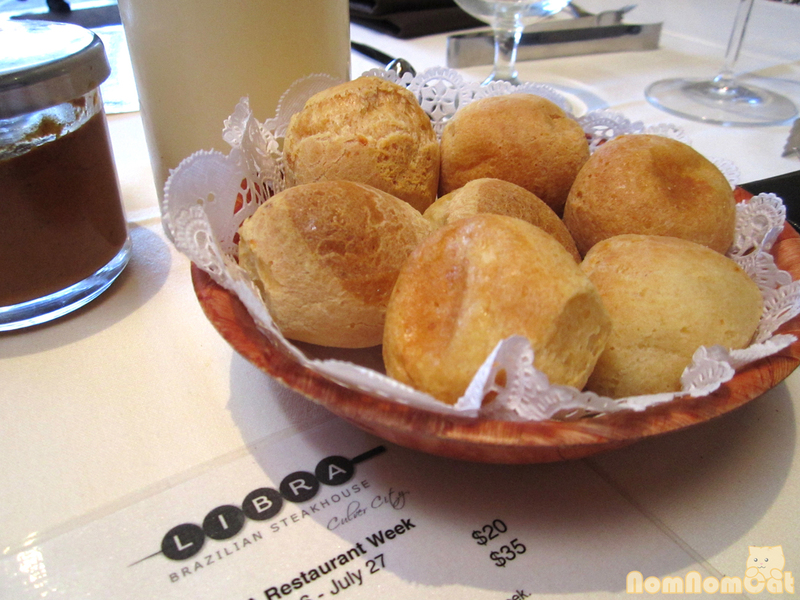 Some of the best Restaurant Week opportunities have to be the Brazilian churrascarias that offer their usual all you can eat fare at the discounted pricing. We’ve taken advantage of Fogo de Chao’s deal a few times, but our friends Helen and Edmund invited us to double date in Downtown Culver to check out a pretty awesome churrasco joint in our backyard — Libra Brazilian Steakhouse. 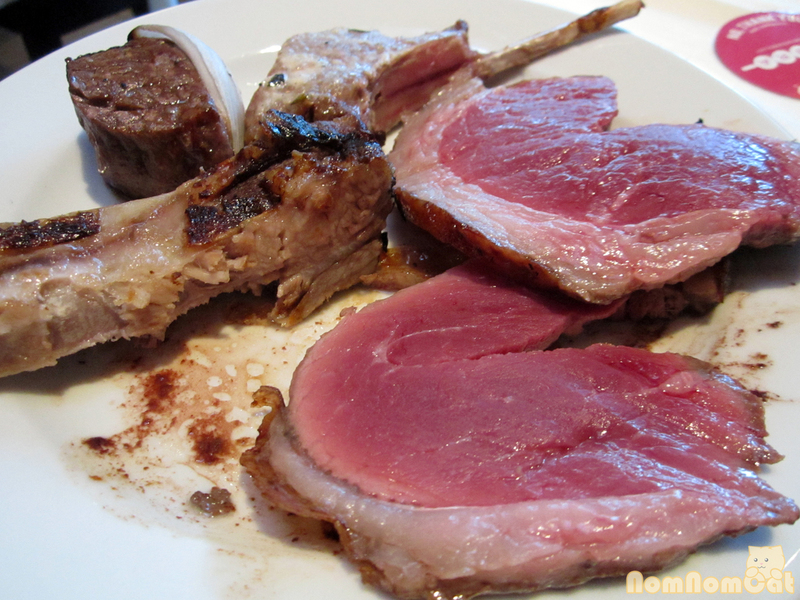 During DineLA, Libra is rated $$ for dinner – only $35/person for the salad bar, hot bar, endless meat, and dessert! First, the cheese bread! I love pao de queijo; they are such wonderful little balls of cheese dough that’s crispy on the outside and chewy on the inside. The ones here, while not quite as amazing as the ones at Fogo, did not disappoint. On to the salad bar! Martin walked right past the entire setup, but I snagged some small portions of shrimp cocktail (chilled and sweet), grilled asparagus (nice char and good to pair with the meat), smoked salmon with creme fraiche and capers (arranged in cute little flavorful bundles), and prosciutto (a bit dry). Somewhere along the way, the salad bar ends and the hot bar begins. We only tried the caramelized bananas, which were literally bananas in a caramel sauce; it was a bit too sweet for us and a different style of preparation than we’re used to. Helen remarked that the “mashed potato wannabe” (mashed yucca) was good, although she got it on two separate occasions and it was a different texture each time… how peculiar. After he was done with those and had stepped away to get more bananas, the same guy made his rounds with a fresh skewer. I knew Martin would appreciate it if I got some for him, so I held out his plate. Way to hook it up! Our server Diego and all of the staff were incredibly attentive. About halfway through our meal, we noticed the distinct lack of chicken hearts and decided to inquire. 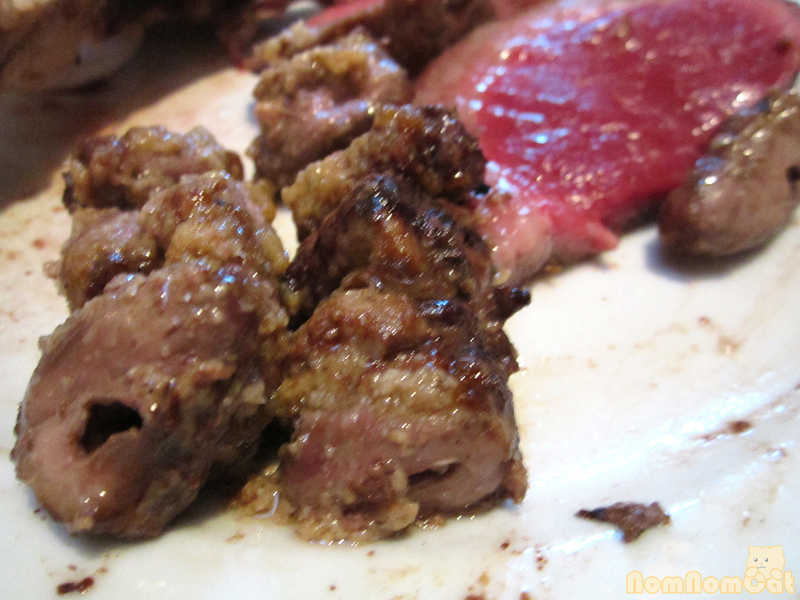 Not five minutes later, a friendly gaucho came out with an entire skewer of chicken hearts just for us. Martin and I each took about half the skewer, sparing a few for our dining companions to sample. We usually eat chicken hearts prepared yakitori style at Japanese joints, like our local favorite Nanbankan, but the ones here were covered in minced garlic and had a wonderful texture. We shared a second skewer and would like to thank the 50 chickens that gave their giblets for our meal. Stunning picanha slices. The gaucho had every right to be proud of these! As I mentioned earlier, by the end, the gauchos knew what we liked and hooked us up with the rarest beef. We partook in some beautifully rare, barely warm but wonderfully seared picanha that was garlicky, salty, and super flavorful. The gaucho looked so excited about its temperature that I seriously wondered if he ran back to the kitchen and snagged that skewer out of the fire just for us before it overcooked. Among other items that we tried were the ribeye (juicy as it should be), prime rib (it was a “reject piece” as Edmund called it, so it was too dried out and sad looking), pork ribs (a little dry and as Helen said “not cow”), and the sausage. We were so stuffed but as they say, there’s always room for dessert! 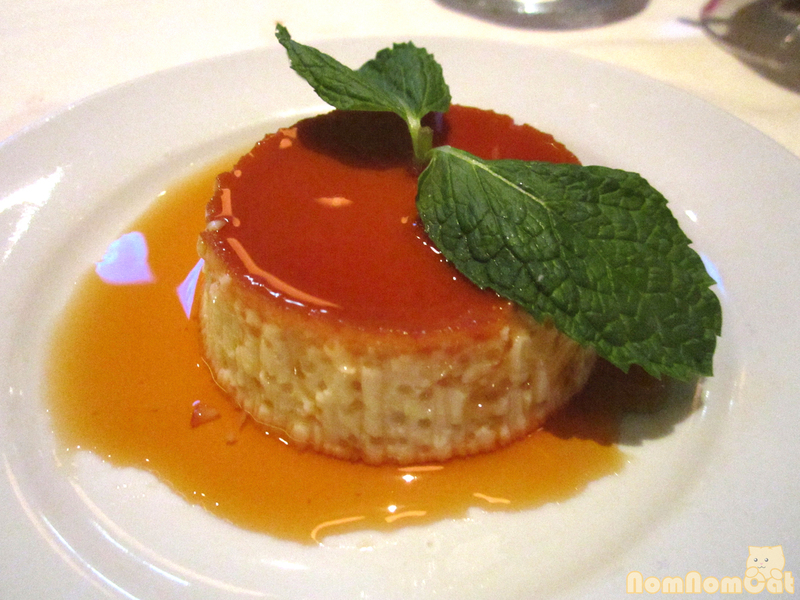 Three of us ended up getting the flan. It was yummy and eggy and arrived in a generous pool of caramel sauce. The flan had a lot of bubbles (intentional?) 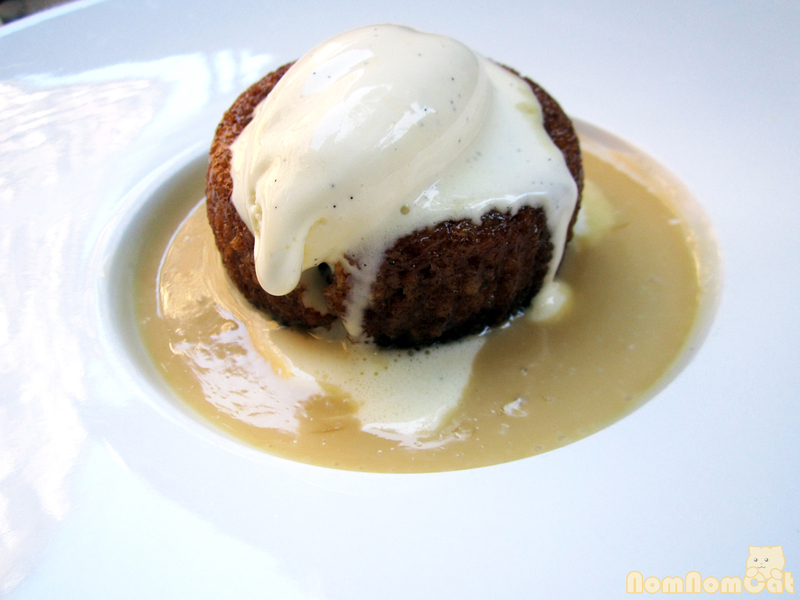 which added a nice light airyness to the otherwise dense custard. The perfect palate cleanser after that onslaught of meat. The service was ridiculously friendly. They really took the time to get to know our preferences and favorite meats and (for better or worse) egged us on to keep eating. We will definitely be back for the great value (even during non-dineLA, it’s about $40/person for dinner), the great food, and especially for the exceptional service. Thank you, Libra, for an awesome date night! DineLA Summer 2012 runs through July 27th. Only 3 days left to check out Libra, Libra’s sister restaurant M Grill, Wilshire Restaurant, Waterloo & City, and other awesome local restaurants!